In the unwinding, everything changes and nothing lasts, except for the voices, American voices, open, sentimental, angry, matter-of-fact; inflected with borrowed ideas, God, TV, and the dimly remembered past. There are mimi-biographies of various people and what they were doing in several time periods between 1978 and 2012. Some of the subjects are poor, some very rich and or powerful, a few middle class. Of the main subjects, “Dean” is an entrepreneur from North Carolina, “Tammy” is a black political organizer from Youngstown, OH , and “Jeff” is in politics from Alabama and then Washington. There are others – a banking insider, a couple of Silicon Valley brains, a poverty-level family and a newspaper man from Tampa. And there are little chapters devoted to the likes of Newt Gingrich, Oprah Winfrey, Sam Walton, Colin Powell, Elizabeth Warren, Robert Rubin, Alice Waters, Raymond Carter and Jay-Z. In addition there are some kind of “area” reports – based on the people and situation of Silicon Valley or Tampa Florida which seem representative of the era. These usually include the tales and ideas of several different individuals. 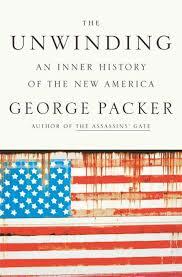 The stories are apparently connected only because the personalities have relevant and personal stories about living through what Packer calls an “unwinding” of America – the time when the banks were deregulated and the housing market collapsed in scandal leading to a serious recession and with virtually no one going to jail. I can only think he means the moral foundations of the country all fell to the power of the dollar. It’s a long book – 437 pages with 430 of narrative giving no “big picture” or guiding narrative. That said, you can feel Packer’s textured liberal ideals and opinions in the telling. Overall I really enjoyed the book – the information, as well as the style and structure. The inward-looking force in his portraits of individual Americans in his book The Unwinding is strong enough to unsettle and even crack the thick crust of conformity to the “new normal” into which most of us have been baked, half-consciously, since around 1980. To repeat, Packer does an outstanding job with these stories. “The Unwinding” offers vivid snapshots of people who have experienced a loss of faith. As a way of understanding contemporary America, these examples are tantalizing. But they are also frustrating. The book is supposed to have social, economic and political implications, but there is no actual sociology, economics or political analysis in it.